You know you may be in for a dud when they don't even spend any time coming up with a snappier title for a summer action film than simply 2 GUNS. But it's Denzel Washington and Mark Wahlberg, so it can't be that bad...can it? Well, because it's them, no it's not that bad. But it ain't good either. Though we get to see the two actors flaunt their action comedy skills (a notable first for Washington), the plot itself (directed by Baltasar Kormákur and written by Blake Masters, who adapted it from the graphic novels) left much to be desired. As the title indicates, the film is about, well, two guys who are obviously armed. At first, we're not really sure whether their partners, allies, enemies, or what. But, for the sake of avoiding any form of the word bromance, lets call them brenemies. Washington stars as Bobby, an undercover DEA agent trying to catch Papi (Edward James Olmos), a Mexican drug lord, in the act by staging a trap for him. That's the simplest way to describe this character whose intentions become more and more convoluted as the film progresses. When we first meet him, he and his, erm, brenemy, Stig (Wahlberg), a perpetually T-shirt clad, wink-friendly naval intelligence officer, are seated at a diner heavily engaged in witty banter (the first of many in the movie). Somewhere in the middle of their exchange, we notice that they're actually planning to rob a bank located directly across the street. Hold on, aren't these two supposed to be the good guys? Yeah, but good guys rob banks sometimes in order to catch the bad guys. Or, at least they do in this movie. But before they commit this federal crime, the movie sloppily flashes back (or forward, or maybe off to the side?) to a scene featuring Bobby and his loverly, Deb (Paula Patton), a rather useless character who tries to be deceptive like the fellas but is really nothing more than a damsel in distress, discussing his grand plans for a bank heist. This is where he might have mentioned why he was even involved in it, but it's hard to pay attention when Patton's bare breasts are clearly in command of the scene. Why is any of this happening right now? Who knows. Flash back (again, unsure of the direction here) and we're smack in the middle of the heist, which goes along swimmingly (Bobby, wearing a Freddy Krueger mask, even stops to comfort a screaming baby). It seems like the unlikely duo have pulled off the act until both realize the other may not be working for their side, and things get a little bloody between the two (hence, becoming brenemies). They split up only to reconcile later in the movie once they learn that things aren't so rosy for them all alone either. Long, convoluted story short, the two find themselves working together again in order to preserve their own lives (and probably because no one else could possibly put up with their incessant yet clever chatter) with Papi and ruthless law enforcer, Earl (Bill Paxton) hot on their tails. We should really take a minute to commemorate the film's one saving grace--the toxic yet hilarious relationship between Bobby and Stig. It's silly, it's often pointless but cures our sleep dependency triggered by the rest of the movie. While Washington capitalizes off his natural sarcasm and ingenious one-liners, Wahlberg gives it right back to him in a series of taunting quips, even pulling out his classic, "tell your mother" line. He reaches so far back in his vault that one could only hope he'd pull out one of his timeless moves from his Funky Bunch days (he doesn't). But even with the tangy chemistry of its two stars, it's hard to get past the nonsensical story and the often gratuitous moments that serve no real purpose. 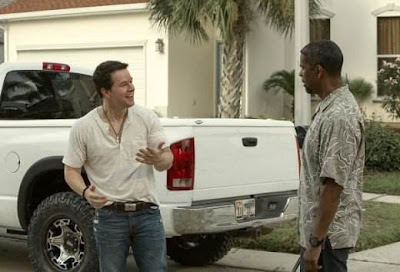 2 GUNS is bubbly, fun, yet unexciting despite its barrage of explosives used. Lets hope Washington and Wahlberg get another chance to work together with a far more decadent script. Great review Candice and you pretty much hit it right on the head for me. I liked their chemistry, but the script needed to be better man.